The Ritchie Leather Sig P220 Compact Stakeout, similar to the Alessi PCH is a very comfortable right handed, inside the waistband holster. The flat backing prevents the discomfort of the firearm protruding into your body making you sore and uncomfortable. 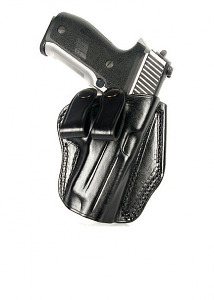 The 1 1/2" belt loops with snaps allows you to remove the holster quick and easy.